1957–, Japanese architect, known especially for temporary structures made from nonstandard building materials and built in response to environmental or societal disasters. common name for some members of the Salicaceae, a family of deciduous trees and shrubs of worldwide distribution, especially abundant from north temperate to arctic areas. related to Poplar Tree, also called “Quaking Aspen” for how it sways in the wind. Whitish bark, which contains salicylin, the natural aspirin also found in willow trees for pain relief and headaches. Inner bark tea used for colds, fever, pain, stomach problems, kidney, bladder, urinary issues, venereal disease, rheumatism, arthritis, diarrhea, worms, menstrual bleeding, anti-inflammatory. Any of several species of poplars (Populus) characterized by weak, flattened leaf stalks which cause the leaves to flutter in the slightest breeze. (Aspen Technology, Inc., Burlington, MA, www.aspentec.com) A leading provider of smart manufacturing and supply chain management software and services for the process industries, which includes chemicals, metals and minerals, pulp and paper, electric power and consumer packaged goods. Aspen was founded in 1981 to commercialize technology developed by the Advanced System for Process Engineering (ASPEN) at MIT. From 1976 to 1981, the ASPEN project was funded by the U.S. Department of Energy and a group of more than 50 industrial participants, after which it went public. Figure 1 (next page) shows the improvement in bulk when 30% 250/85 HB aspen is co-refined with 70% U. 8mm) and high fines content (17% to 25%), aspen BCTMP offers superior formation compared to most kraft pulps. Close to that looping road you'll see aspen with heights of 90, maybe even 100 feet. A stand of apparently similar aspen may consist of trees sprung from several different clones. 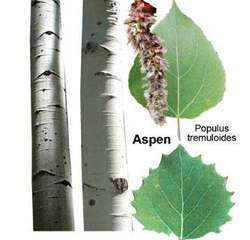 If we utilize fast-growing aspen as reconstituted boards, which is what MB will be doing," says Brown, "we can afford to leave more pines and let them grow to 200-300 years. Although the average aspen harvest from county-managed land is small (12 to 14 acres per cutting block), Brown admits that a lot of the early aspen cuts in Cass were laid out in straight lines and squares. Any ordinary share repurchases by Aspen are subject to rating agency considerations, the market price of its ordinary shares, Aspen's ongoing sources and uses of cash and the liquidity requirements of its insurance and reinsurance business. Commenting on these appointments, Paul Myners, Aspen's Chairman, said, "I am delighted to announce the appointment of three new directors, which will strengthen further the Aspen Board. In addition, and reflecting the continuing growth of Aspen's underwriting activities in Bermuda, Julian Cusack, Aspen's Chief Financial Officer and Chief Executive Officer of its Bermuda-based operating company, Aspen Insurance Limited ("AIL"), is appointed to the expanded role of Chairman and CEO of AIL. Since its introduction, the capabilities of Aspen PIMS have been extended with a series of major developments that give users better insight into the solution economics, enabling them to make more profitable decisions. Aspen PIMS Global Optimization uses the latest algorithmic procedures that were developed in collaboration with the world's leading academic researchers. AspenTech, Aspen HYSYS, Aspen RefSYS, Aspen HYSYS Upstream, Aspen Plus, Aspen Custom Modeler, Aspen Dynamics, Aspen Properties, Aspen Polymers Plus, Aspen Batch Plus and the aspen leaf logo are trademarks of Aspen Technology, Inc.